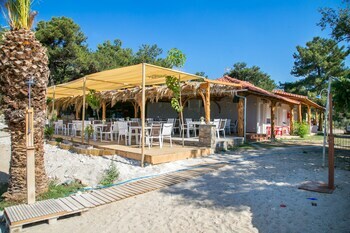 With a stay at Sotiris Studios in Thasos, you'll be on the beach, just steps from Pefkari Beach and a 4-minute drive from Potos Beach. Free self parking is available onsite. With a stay at this villa in Santorini, you'll be within a 15-minute drive of Museum of Prehistoric Thira and Art Space Santorini. A roundtrip airport shuttle is complimentary (available on request). When you stay at Zambia Apartments in Plakias, you'll be near the beach and steps from Plakias Beach. Free self parking is available onsite.